The image above shows the coverage of this map. The regions inside the brown rectangles are covered. 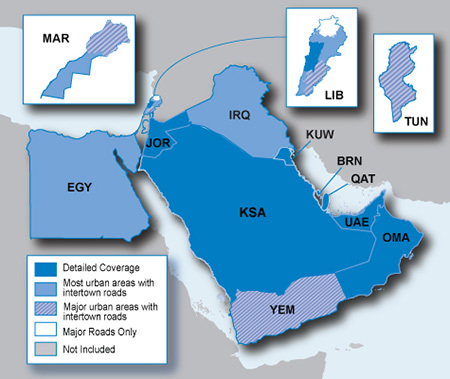 This product provides a detailed street map of the Middle East, see examples below. MapSource City Navigator Middle East NT is shipped on an µSD memory card, an µSD-to-SD adapter is included (µSD is also written as microSD). The µSD/SD memory card has the advantage that the map is immediately available as soon as you plug in the memory card. In addition, you may use the map on any number of devices, but only on one device at the time. The GPS has to have a SD or µSD slot. You may also use the map on a computer, if the free software BaseCamp is installed and the GPS is connected with the computer using a USB cable, see MapSource versus BaseCamp. If your computer has a slot for SD cards, you may insert the memory card into the computer directly, which provides faster access to the map. Significant increase of the level of details: If there is a built-in map, then the map of the Middle East will overlay the built-in map. Outside the Middle East, the built-in map is still available. Most GPS devices support enabling and disabling maps, so you can easily switch between different maps. If your GPS device supports profiles, then you can bind different maps to different profiles. The images below show areas of the map of the Middle East.